Recovering a stolen vehicle can be much easier if you follow specific steps, and if you take the necessary preventative measures. Although it can be especially stressful and frightening to have your car stolen, there are some important things to keep in mind. Always stay calm. Vehicles are stolen every 44 seconds in the US, according to the National Highway Traffic Administration. That means it’s not unlikely for your vehicle to be taken, especially depending on your location. Before you do anything else, take some deep breaths and make sure you are in a safe location. Make sure it’s actually stolen. Though it might sound simple, Allstate notes that one of the first things to do when your car is missing is to check for “No Parking” signs. Also look for fire hydrants, private drives, or any other reason your car might have been towed. Your car may also have been repossessed, depending on whether or not you’ve been paying bills. Call the police. Regardless of whether your vehicle was impounded or stolen, you’ll have to call the police. Most tow-truck drivers are required to inform the police when towing vehicles, so you can discover where your car is through a phone call. If it was stolen, a police report will be essential for insurance and warranty purposes. 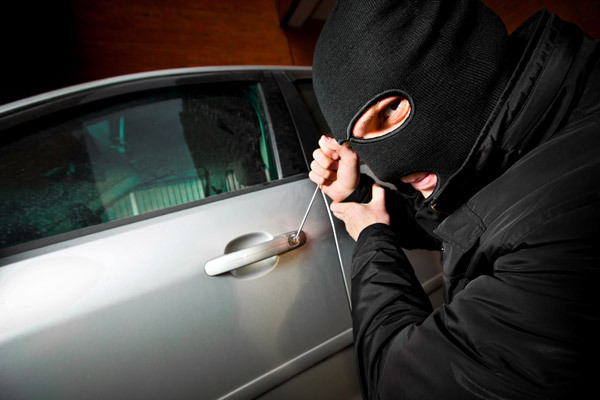 Try and keep copies at home in a safe place at all times, that way you are prepared if your car is stolen. Contact your insurance. Aside from getting cash for your policy, you should call insurance to know that you are not using your vehicle any more. If a thief uses your car for illegal activity, you can’t be held liable if you call beforehand and report your car stolen. Prevent theft in the first place. Always park in well-lit locations, and be sure to lock your car. Keep your windows closed, and be sure to hide any valuables. If possible, get a LoJack or OnStar system to keep track of your car in the event it is lost or stolen. This will help police find your car before it’s lost forever. Finally, purchase comprehensive or GAP (Guaranteed Asset Protection) coverage to keep you protected financially if your car is stolen. Having your vehicle stolen is a very stressful time and we at Bradshaw Greer hope it never happens to you! Chevy has been the Official Vehicle Sponsor of Major League Baseball® since 2005, frequently supporting the league and its various charitable programs. The automaker recently awarded the MLB All-Star vehicle to Eric Hosmer—a Chevrolet Colorado Diesel Midnight Edition—during the award ceremony. Hosmer went two-for-three with a home run during the All-Star Game, helping to score a total of three runs. According to Chevy, he was able to choose between a 50th Anniversary Edition Camaro Convertible or the Colorado Diesel Midnight Edition. He chose the rugged pickup, which was better suited for his taste. This is just one of the ways Chevy supports the MLB. The brand has also helped to raise more than $28 million for youth programs associated with the MLB, helping more than 5.2 million young people. More than 1,500 Chevrolet dealers are involved in programs like Chevrolet Youth Baseball, helping kids to see the value of hard work. Hosmer’s hard work serves as a great example to aspiring kids, one of the major reasons Chevy was thrilled to award him a brand-new Colorado.